Can we get one thing out of the way? Meditation is hard. It’s not all “om” and awesome feelings. Reality probably looks a lot more like this: You sit down, eager to get in the zone and be the calm and collected type of person who meditates. Then reality sets in. You can’t stop counting seconds as they go by. Your brain spins out. You realize you’re stressed or mad about something. What am I doing wrong? How much longer? Am I sitting right? Should there be some kind of revelation here? While meditation will always have its hard moments, this next part should come as a relief: You don’t have to sit in the lotus position for 30 minutes every day, nor do you need a fancy meditation corner with incense burning to reap the benefits of a meditation practice. All it takes is a couple of minutes to make a difference. In fact, Sandy Weston, a well-known health and wellness guru in the Philadelphia area, has a new book titled Train Your Head and Your Body Will Follow that’s rooted in this exact idea. “It’s great if you can sit on top of a hill for an hour and meditate, but for the rest of us, that’s not reality. And it’s really not necessary,” she says. Taking a minute before you get out of bed in the morning is a simple place to start. Still, that idea can seem like a huge task. We reached out to Tracee Stanley for help in that department. She’s a longtime yoga teacher who’s experienced in meditation (you can catch her leading meditations at Wanderlust festivals across the country this year), and she broke down four short but powerful techniques. This is considered a balancing breath. When nerves or anxiety arise, make this your go-to meditation because you can do it from pretty much anywhere. “It’s the perfect meditation to do every day because it’s centering,” says Stanley. Start in a sitting position, whether in a chair or a meditation posture. Notice the natural flow of your breath for one minute. “You’ll begin to notice that one nostril is more dominant than the other,” says Stanley. For the first minute, without using any fingers to hold your nose closed, imagine inhaling through the dominant nostril and exhaling through the same nostril. After a minute, start to inhale through the dominant nostril and exhale through the opposite nostril. Then inhale through that same nostril and exhale through the dominant nostril. Continue for four minutes. This is called pure breathing or circular breathing, and it can help you cultivate stillness. Sit in a chair or on the floor. Make sure your spine is straight and elongated. Start by observing your breath as it is. “Don’t try to shape or control it,” says Stanley. Become aware of the spaces between your inhales and your exhales. Observe this for two minutes. Continue for four to five minutes. According to Stanley, it’s best to do this meditation in a dark room. If you can’t do it in a dark room, try placing a light scarf over your eyes. And when you’re done, try to remember the feeling and come back it throughout your day. “See if you can stay in that space and hold on to that feeling of deep relaxation,” she says. Lay down flat on your back. Legs should be about hip-width apart. Extend your arms by your sides and face your palms up. Stanley advises that nothing should be touching your fingers. Start to notice your breath. As you inhale, imagine the earth is rising up to greet your body. As you exhale, imagine your body is surrendering to the earth. “It’s this idea that the earth is coming up to offer support, and you’re letting your body release into that hold,” explains Stanley. Do this for about a minute. Listen to your body breathing and say to yourself, “I’m aware that I’m breathing in. I’m aware that I’m breathing out.” Then, shift your thoughts to “The body is breathing in. The body is breathing out.” The goal is to disconnect the idea that you’re the one who’s breathing, that your body is doing the work instead. Then, count backward from 27 with every exhale. “Every time you count down a number, feel as though you’re releasing a layer of tension,” she says. If you lose your place while you’re counting, start back at 27. Allow yourself to rest in this place of freedom for as long as you can. When you’re ready to come out of the meditation, feel yourself lying on the floor. Deepen your breath. Wiggle your toes and your fingers, and roll onto your right side. Slowly sit up. Feeling down and out? 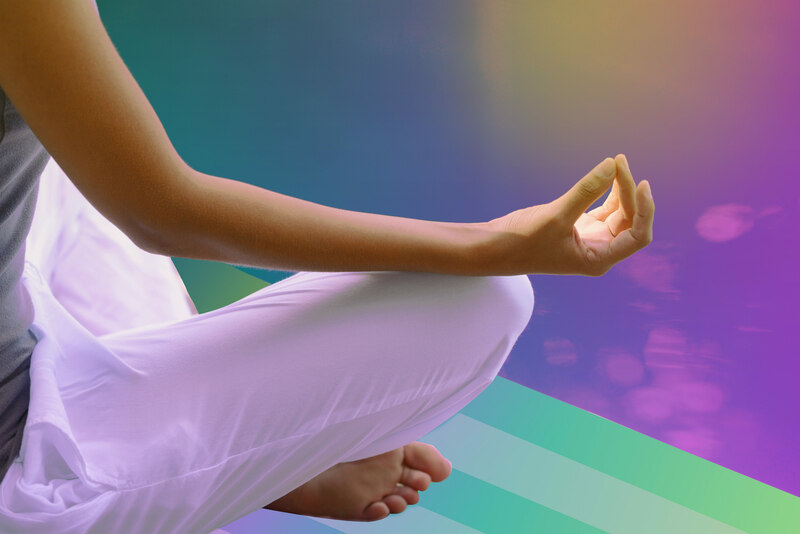 This meditation allows you to cultivate acceptance, resiliency and contentment. You’ll feel more equipped to handle whatever comes your way and move forward. Notice your body inhaling. Notice your breath as it enters your nostrils. Imagine you’re physically inhaling a sense of vitality. As you exhale, imagine you’re releasing whatever may be holding you back or weighing heavy on you. As you inhale again, Stanley says to sense a light or a presence that’s actually riding on your breath. Feel it move through both nostrils and up to your third eye (which is the midway point between your eyebrows). Feel it come out from your third eye and back out both nostrils. Continue for about two minutes. Now, imagine the light is collecting at your third eye. Rest your attention there, and become aware of whatever thoughts or feelings arise. Imagine they’re being consumed by the light at your third eye. Whether the thoughts are good or bad, let the light consume it. “[Don’t get] involved in the story,” says Stanley. This post was sponsored by thinkThin®.